This tour is without parallel from the outset; simply because Judy, your guide, is a descendant of the Geddes family, who is mentioned in, Satchmo: My Life in New Orleans (Louis Armstrong) and whose family buried Buddy Bolden ( King of Jazz). These Two Phenomenal Jazz musicians were closely connected to the Geddes Family, Pioneer UndertakingFamily of the South (1876- present). Hear about it on the tour. An introduction to the history of the French Quarter( the original city) leads into a thorough history of the only true American artform, Jas, Jass, Jazz. 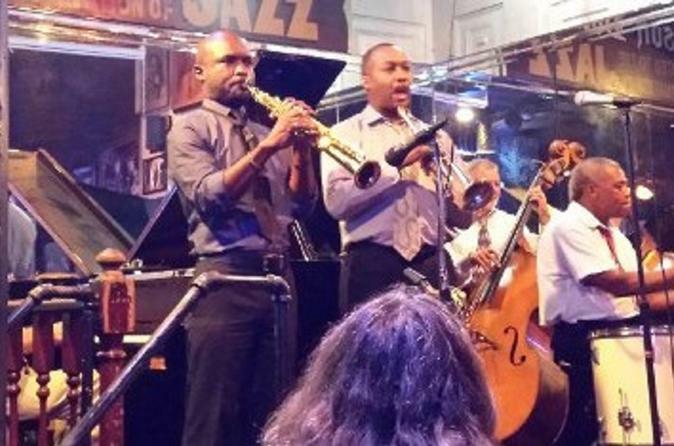 Stops at two Jazz venues, enjoying fantastic jazz and sipping on some of New Orleans famous cocktails will the tour take. An evening tour not to be missed. New Orleans at night is a Delight! Our tours are more than a tour...they are an experience, a Ba "joie de vivre" experience (joy of living)! Judy Geddes Bajoie, a native and former history teacher, brings a unique perspective and authentic approach to each tour. Her Ba "joie de vivre" is present in all of her tours.